Luke Donahue ‘17 reviewing medieval manuscripts from the Hesburgh Library’s collection. 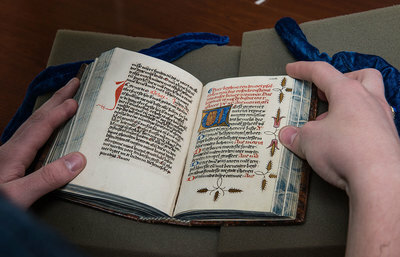 One visit to the Hesburgh Library’s medieval manuscripts collection, and Luke Donahue ’17 was hooked. Donahue paging through a manuscript. That experience during his first-semester German class significantly shaped his Notre Dame education. While he initially planned to study physics, Donahue decided to major in theology and German and add a minor in medieval studies. He studied abroad in Germany and received University funding to spend two more months there examining medieval manuscripts. His academic interests culminated in an interdisciplinary senior thesis, in which he translated a set of medieval German prayers to Mary and investigated the life of the nuns who wrote them. 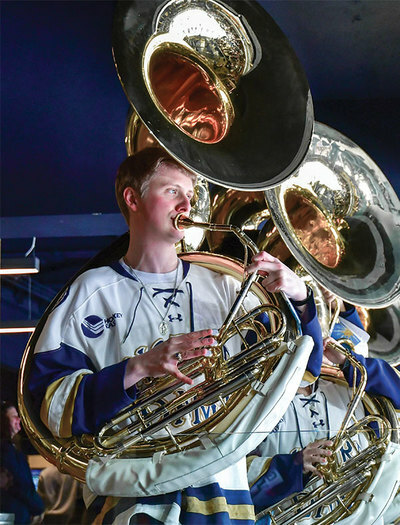 Donahue playing tuba with the Notre Dame hockey pep band. 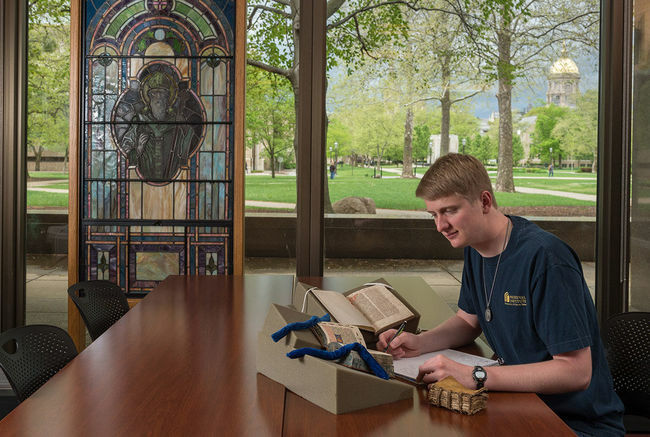 Donahue’s undergraduate research experience helped him learn field-specific skills in medieval paleography as well as broader skills that will continue to be valuable in the future. After graduation, Donahue received a Fulbright research grant and a DAAD research grant, but declined both in order to enter the seminary for the Congregation of Holy Cross. A member of the Glynn Family Honors Program, he participated in a Marian devotion group while on campus. He played tuba in the Notre Dame marching band and a hockey pep band. And he spent two summers participating in service programs, working with the homeless and providing spiritual education for children and teens. Through it all, he saw Notre Dame’s Catholic identity as a common thread. Originally published by Carrie Gates at al.nd.edu on June 20, 2018.